I'm so excited to say that our new range hood is here and already installed! I have been drooling over stainless steel appliances for years now and I can't believe I am finally looking at them in MY kitchen! We still need to update the fridge, so maybe we can do that later on this summer. 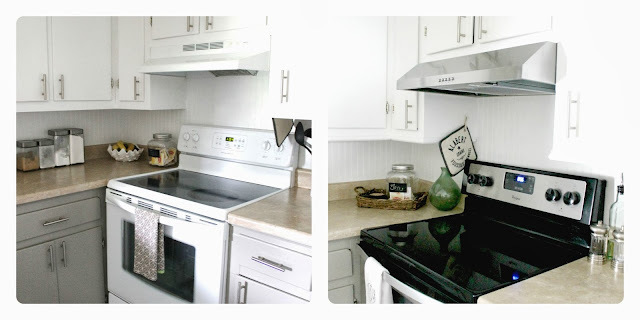 We were able to score some really great deals at Lowe's on the stove and the dishwasher a while back. It all started when my dad took me to get a new dishwasher for my Christmas gift (pretty generous gift!) Our last one had stopped working months earlier. When we got to Lowe's I couldn't believe the great deals they had going on! This was around the time of Black Friday. I was able to get a dishwasher and stove for the amount of money my dad gave me for a dishwasher. Well, we put about $100 in of our money, but it was sooo worth it! I tried to give him back the money left after the dishwasher was purchased, but he would not take it, and insisted I spend it on something I wanted for the house. Totally the best Christmas gifts I've ever received! This past weekend we picked up our range hood, which completed the whole look and feel. I found it at The Home Depot for only $97! 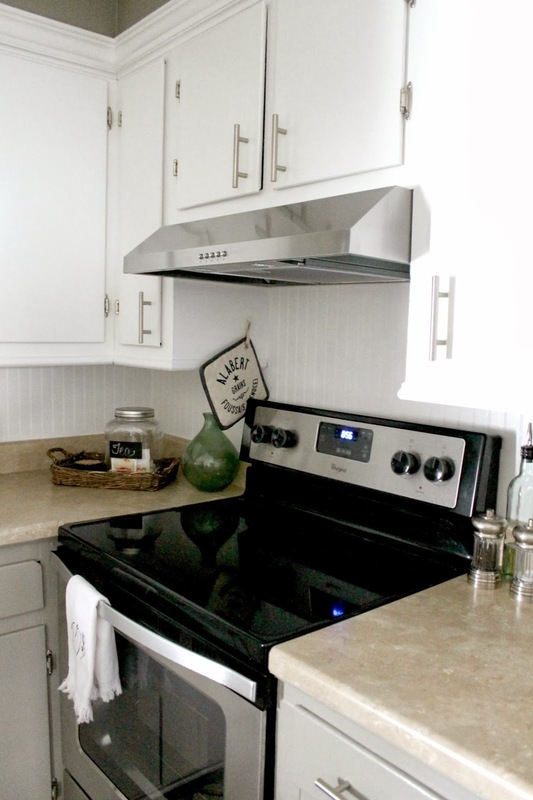 I thought that was a great deal for a great looking range hood. It's very sleek and simple, exactly what I was looking for. Here is a shot of our previous white appliances next to our new stainless ones. Lowes had great deals then! We bought the fridge, dishwasher and stove all at once then because it was the same price as other stores were selling the fridge (only!). 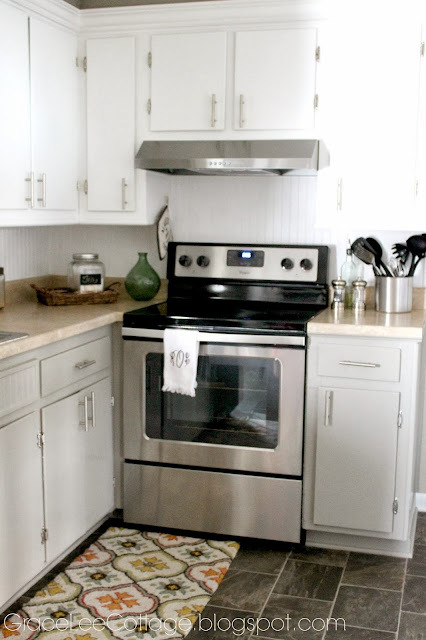 Love the range hood, it's beautiful! What kind of countertops do you have? Thanks Megan! The counter tops are from Lowes also. They are the laminate ones that they always have in stock. Looks amazing! I've been perusing the after Christmas appliance sales in search of some stainless too... There are some great deals. Hey Krista! Thanks so much. Yes, I'm still on the hunt for a fridge so I'm keeping my eye out on the great deals too! Good luck with your search! Lovely! I had to laugh when I saw the before picture. We still have those awful handles on our outdated kitchen. What an adorable space! We're working on our kitchen, too, and it's amazing what you can change without actually moving any cabinets or appliances. Yes, absolutely! Thanks for visiting and commenting! Have a great day! Thank you so much! And yes they are! Thanks for stopping by! Wow! The kitchen has come such a long way. It is beautiful! Thank you Nikki :) It's getting there, little by little. Thanks for visiting! Wow! !1 What a fantastic makeover! !1 Thanks for sharing it at Monday Funday! Leah, your kitchen is sooo pretty! I love everything about it, but I'm thinking I need that rug! Can you share with me where you purchased it? Thanks! Hey Melissa! Thanks so much! The rug is from Target! I'm pretty sure they still have them and they come in all different sizes! Oohh love the new stove! BUT THE RUG!! I have to know where you got that kitchen rug? I LOVE IT!!!! Hey! Thank you :) The rug is actually from Target! I think they still have them in stock, and they come in all different sizes! We have a similar kitchen, with lower cabinets & soffits. I think your backsplash is lovely, but I'm wondering where your electrical outlets are? We have lots of light switches and outlets which would probably make the backsplash look choppy. Hey Carol! We have two electrical outlets. One is behind the canisters and the other one is behind the paper towels, so they are hidden. I keep all of my small appliances, like our toaster, etc. in a cabinet and I only bring them out when I need to use them, so when they are not in use my outlets are hidden by the accessories. Surprisingly though they blend in well with the back splash even when they are showing. We chose bright white outlets and outlet covers, so they blend right in with the bright white bead board. Hope that's helpful! 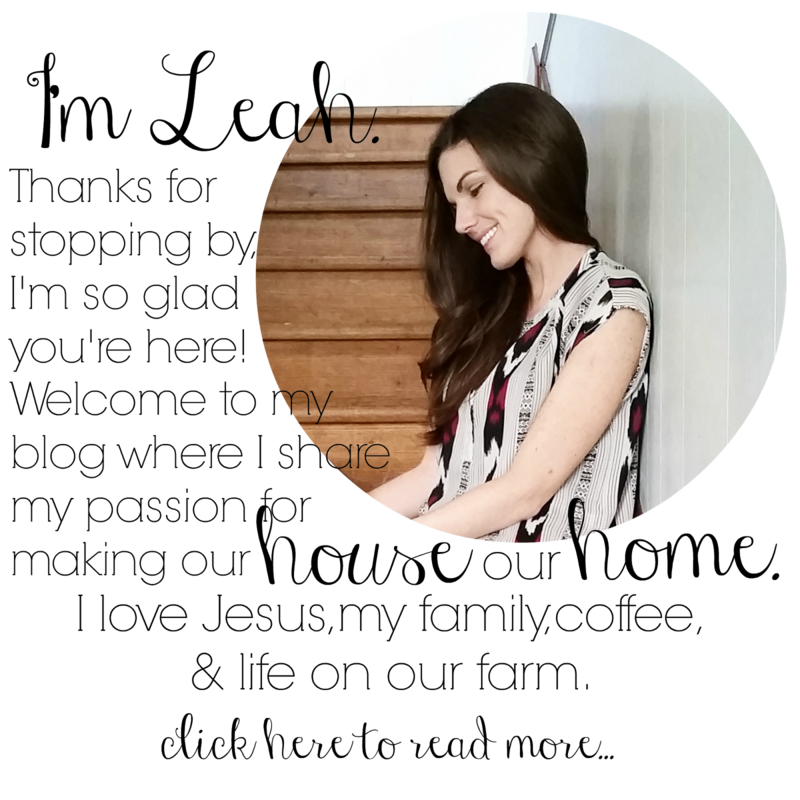 Thanks so much for visiting and commenting! What a fabulous makeover!! Can I ask where you purchased the rug?? Me too! dying to know! Thanks so much! The rug is from Target! I purchased it last Spring or Summer, but I'm pretty sure they still have them! 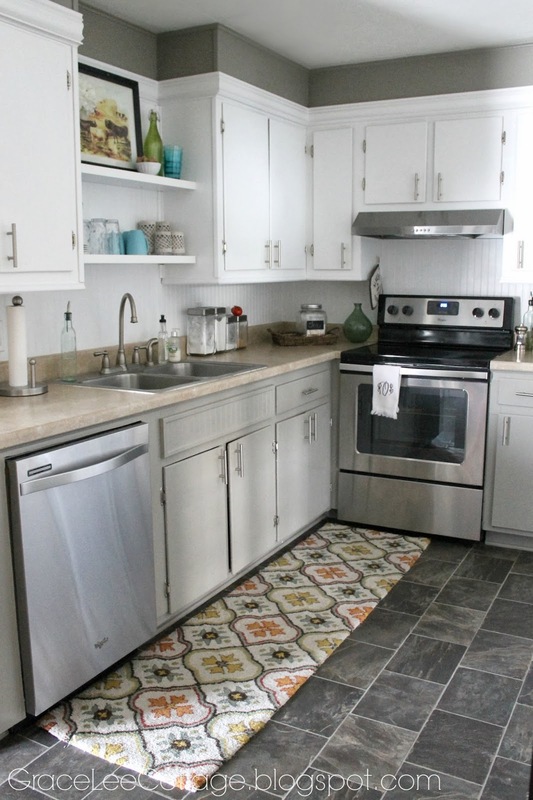 Your kitchen transformation is so amazing! Love it! The kitchen is looking awesome – congratulations. I too love stainless steel and went for the same when we recently remodelled. I persuaded my husband to include money in the budget to upgrade all our small appliances to stainless steel too. Got rid of the mismatched items and now everything is in steel – blender, wok, toaster, mixer … all lovely and shiny. Style your home and kitchen with Cata Appliances like kitchen chimneys, built in hobs, built in hoods, refrigerator, dishwasher, ovens, exhaust fan etc.